I kinda miss the Toyota Matrix. It was a solid hatchback with Toyota reliability and a modicum of style. 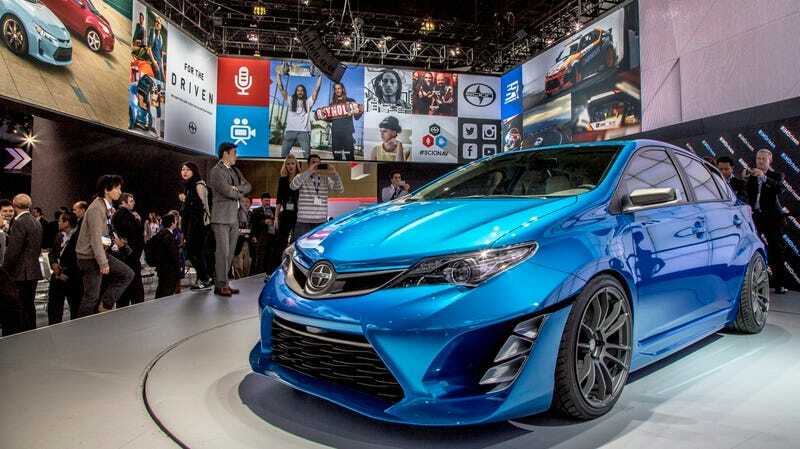 Sure, it was based on the Corolla and had the driving dynamics to match, but the XRS wasn't a bad steer and with the Focus, Golf, and Mazda3 dominating the hatch market, Toyota – er, Scion – needs to step up. Enter the iM. Yes, it's just a tarted up Euro-market Toyota Auris, but that's not a bad place to start. It's packing an independent rear suspension, and there's a range of drivetrains available abroad – from diesel to hybrid to all-wheel-drive – but the Scion version is all but assured to get the same ubiquitous and moribund 1.8-liter four-pot sending around 150 hp to the front wheels. But what it's lacking in performance prowess, the iM makes up for with concept car ornamentation, starting with a stanced suspension dropped over 19-inch split-spoke wheels and four-pot calipers, and finishing off with the sextet of fauxluminum intakes up front that appear to house individual LEDs. Most of that stuff is going to be ditched on the way to production, but that's what we'd expect when it lands next year for less than $20k.